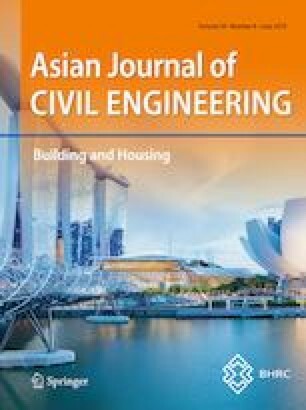 This study presents an experimental and theoretical study on the axial compressive response of cement–clay interlocking (CCI) hollow brick masonry walls. The axial compressive response of the masonry walls was investigated by performing laboratory tests on large size (1000 mm × 1000 mm) CCI hollow brick masonry walls. Hydraulically pressed cement–clay interlocking (CCI) hollow bricks were used for the preparation of the masonry walls. CCI hollow brick masonry walls were constructed using different techniques to represent existing construction practice in Thailand. In this study five masonry walls were constructed and tested under pure axial compression. One masonry wall was constructed by placing CCI hollow bricks over each other in the running bond pattern without using any binding material (i.e., ungrouted masonry wall). In the second and third wall, circular and square holes in the CCI bricks were filled with ordinary portland cement–sand grout and high strength nonshrink cement–sand grout, respectively. The remaining two walls (i.e., wall number 4 and 5) were similar to the wall number two and three, however, prior to the grout filling, steel bars were also inserted into the holes at different locations to reinforce the CCI hollow brick masonry walls. The experimental results show that cement grout impact compressive strength and axial deformation of the CCI brick masonry walls, and that the axial compressive strength versus axial deformation relationship becomes increasingly stiffer as grout strength increases. It was also found that the reinforced CCI hollow brick masonry walls exhibit very ductile damage pattern as compared with unreinforced CCI hollow brick masonry walls along with an increase in the ultimate load carrying capacity of the CCI masonry walls. Based on the experimental results, the performance of existing compressive strength models to predict the compressive strength of masonry is accessed to examine its applicability to the CCI hollow brick masonry walls. It was noticed that none of the existing models are capable of precisely predicting the compressive strength of CCI hollow interlocking masonry. The authors are very grateful to the Faculty of Engineering, Srinakharinwirot University, Thailand, for providing research grant (Research Grant ID 568/2560) to carry out the research wk. The authors are also very thankful to the Asian Institute of Technology (AIT) for supporting test facilities.